Oh, my, I have been on a hunt for a simple chocolate cake recipe that is super moist yet a crowd stunner. And yes, I found one, so without taking any credit, I’m gonna tell you, that this is a recipe written by Margaret Fox for Food 52, so head on over there and get the full list of ingredients and procedure. I am however going to tell you how to take this cake from chocolate to Woah, Chocolate! 1. Substitute the Cold Water in the recipe with Cold Espresso (Same proportions), it’s just one of those things that elevates the chocolaty flavour and makes the cake have an extra kick. 2. Add orange This screams festive spirit, so go on, grate away. 3. Add more chocolate: I’ve made this cake before, so I knew the level of depth was just not enough for me, so this time I added a half cup more cocoa powder and also added half cup chocolate chips. 4. Bake more: Yes, the first time I made it. I CRIED. The cake was under done and yes, I did do the wooden pick test. However, since this recipe uses no eggs, just bake it an extra 5 minutes to ensure it is cooked. I promise you, It’ll still be the decadent. 5. When it comes to topping this cake, I’d recommend chocolate ganache. It’s just the moist-ness (hate that word, btw) goes will with the velvety texture of the ganache. The second best option is a chocolate buttercream and last and my favourite way to look at it is just a plain old dusting of snow (a.k.a confectioner’s sugar). 6. 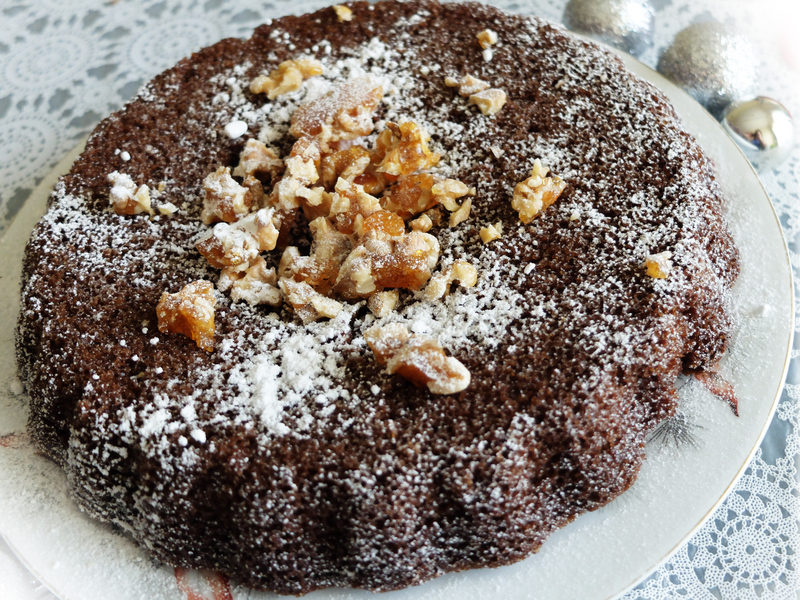 Since the cake is so soft, I needed a crunchy texture, you can just top it with baked pecans in honey or do what I did, create a walnut brittle. All you need to do is take a cup of sugar and caramelise it and then pour it on a flattened bed of chopped walnuts (pecans and almonds will be great subs as well). 7. If you really do want to be on Santa’s naughty list, here’s another way. Take a cup of rum mixed with sugar and soak pitted cherries in them. After it has been soaked for 3 hours, take it on the gas and let it bubble away. Cool and pour over the cake. Pipe chocolate buttercream on in florets and finally shave white chocolate, you’ve got an easy black forest inspired cake! I hope you’ll enjoyed these ideas, let me know your favourite ways to top a chocolate cake.